The JW Marriott at Mussoorie laid out one the most fabulous breakfasts I have experienced in a very long time. I would like to state at the outset that this blog is NOT commissioned by anyone and is written like all my posts of my own freewill. I share joyful memories and this was one such wonderful experience. 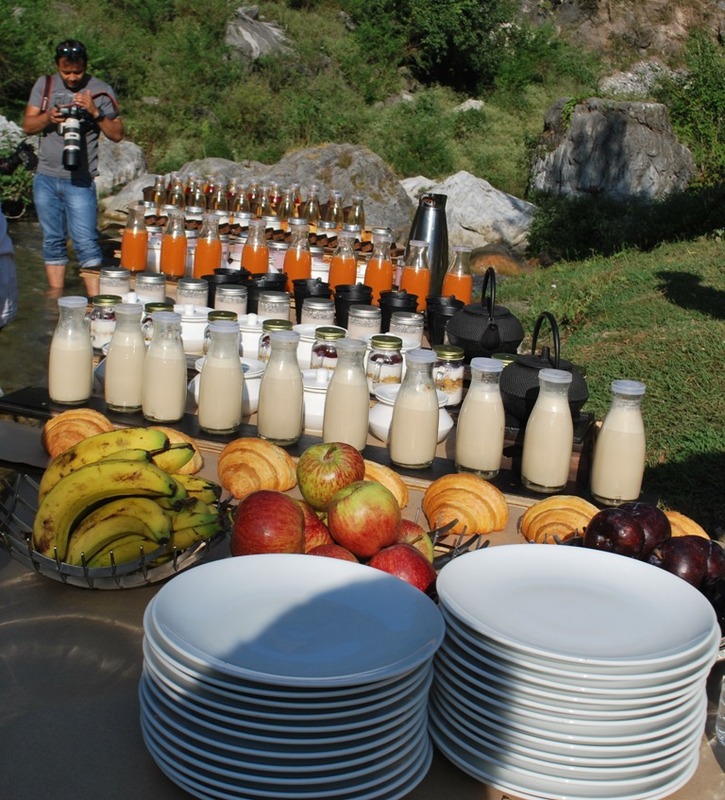 As part of their One Year Celebrations they organized a memorable breakfast experience in the Lap of Nature. 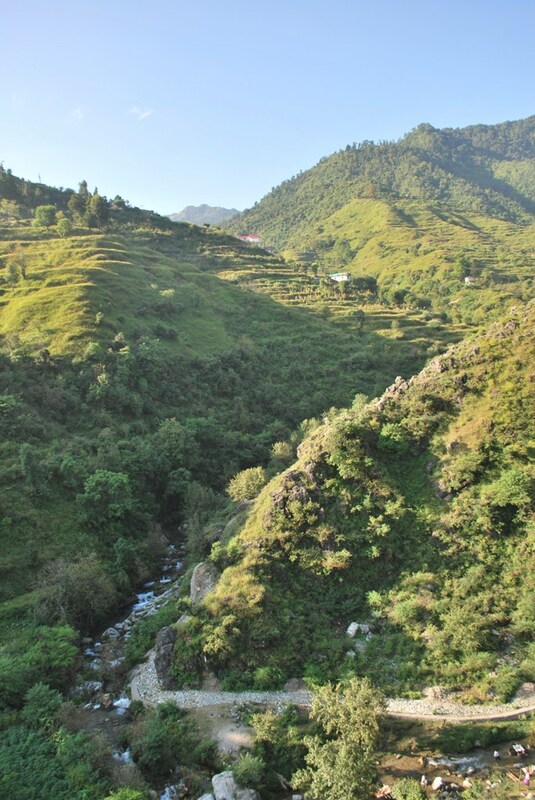 Starting from the JW Marriott Walnut Grove Resort & Spa, Mussoorie was organized a small refreshing trek to a Himalayan mountain stream. 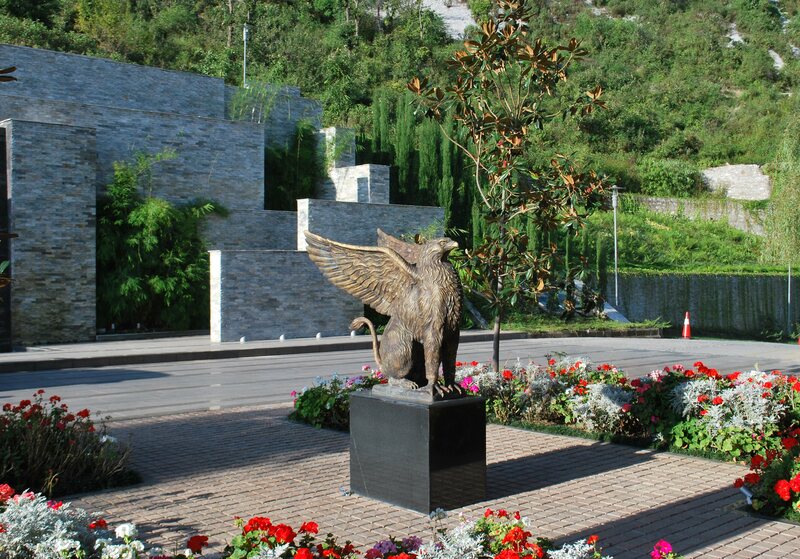 The Griffon at the entrance of the Resort invites us for a delightful adventure. Impeccably organized with walking sticks for everyone we had to walk down this valley to the river . It was a glorious day and the walk down to the stream though steep was very exciting. 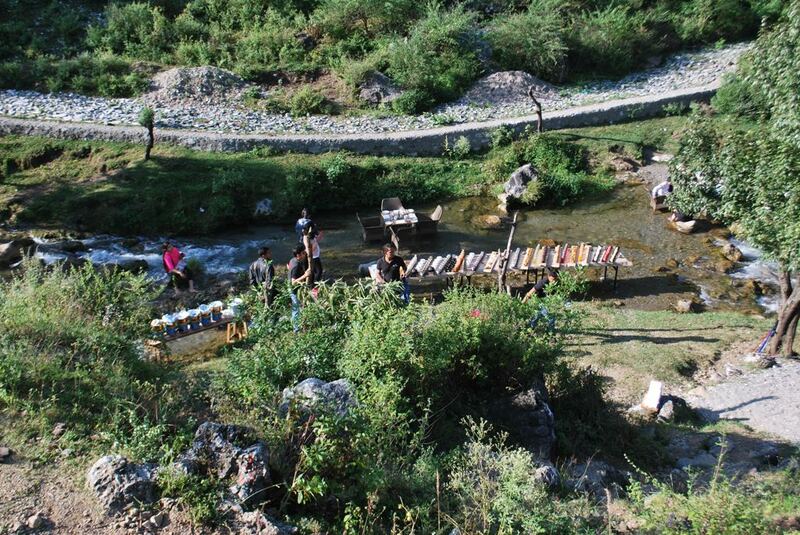 The fabulous venue was a mountain stream in a desolate Himalayan valley . 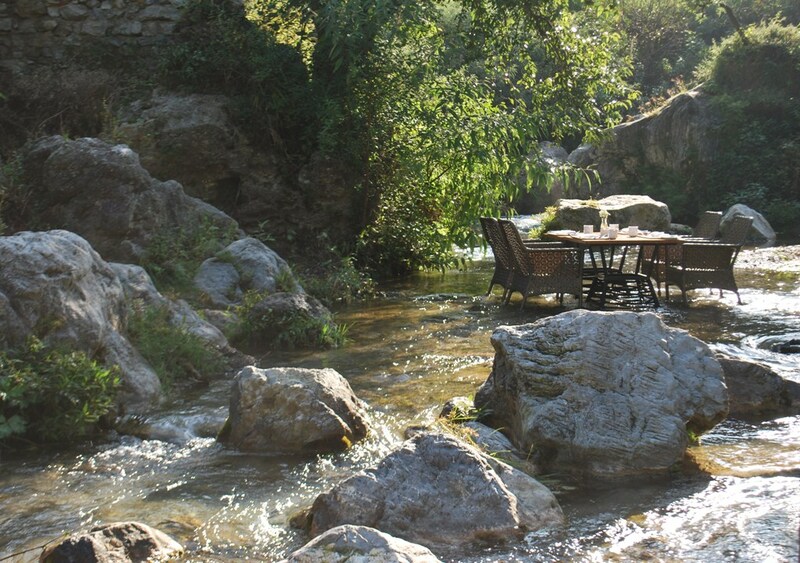 The first breathtaking view of a beautifully laid out table within the stream had me gasping for air. It was after all an awesome view. Have a look. 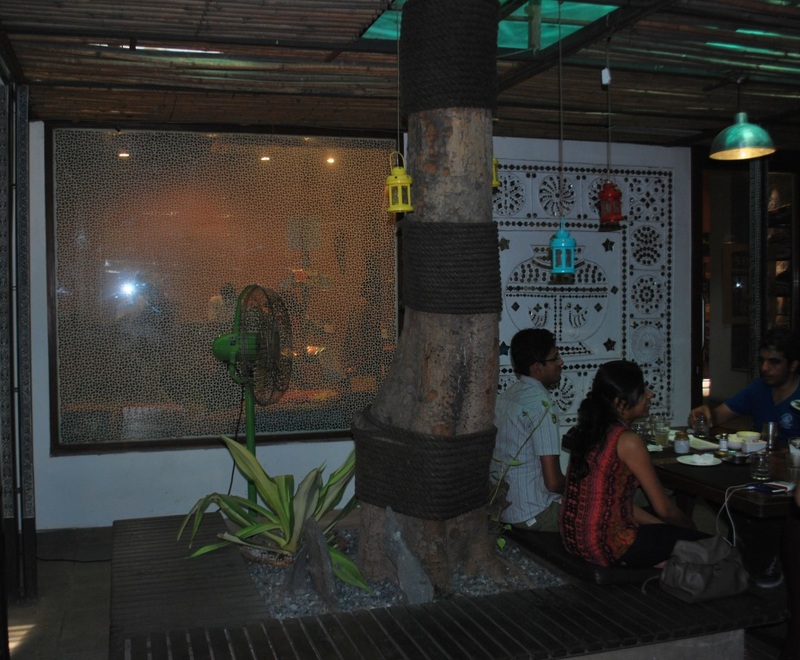 The dining tables and chairs were set within the rivulet and the trees formed a perfect natural canopy . We were to literally have breakfast in the Lap of Nature. The sunlight filters through the leaves and reflects off the gurgling waters of the mountain stream.The trees had stretched their arms out as they arched over the cool waters of the river. The team of JW Marriott led by their F& B Manager Prateek had created a magical breakfast destination. Bravo to them all for visualizing and executing a dream destination for breakfast. The gurgling waters of the river. The layout was fabulous as you can see for yourself in the picture that follows. It was a feast for the Kings. 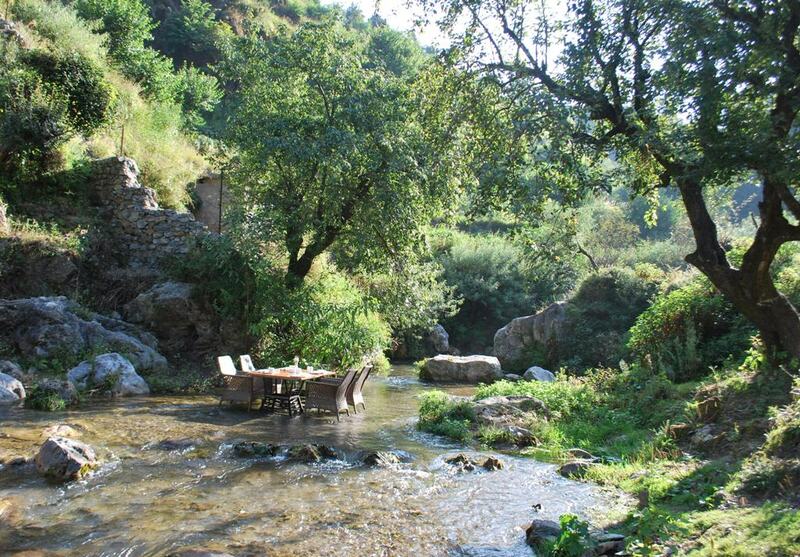 The Chef had arranged a banquet in the midst of this delightful mountain stream. Jeremiah had rolled up his jeans to his knees to negotiate the path from the banks of the river to the dining tables in its midst. A closer look at the Inviting table. The ladies take their seats and a lovely breakfast unfolds. ( freshly made Indian bread ) with black masoor daal ( a lentil) as a filling. Do check it out when you stay at this property. I look up at the mountains around us and see one of the waiters make his way all the way to the top of the Hill . What an effort for the entire staff, hats off to them. The team at JW Marriott had surpassed themselves . The labour of love was evident in every detail from selection of the venue to the delicious food they served. Sharing this Joyful experience through this blog has made me relive the entire experience once again. Thank you to all at the JW MARRIOTT. 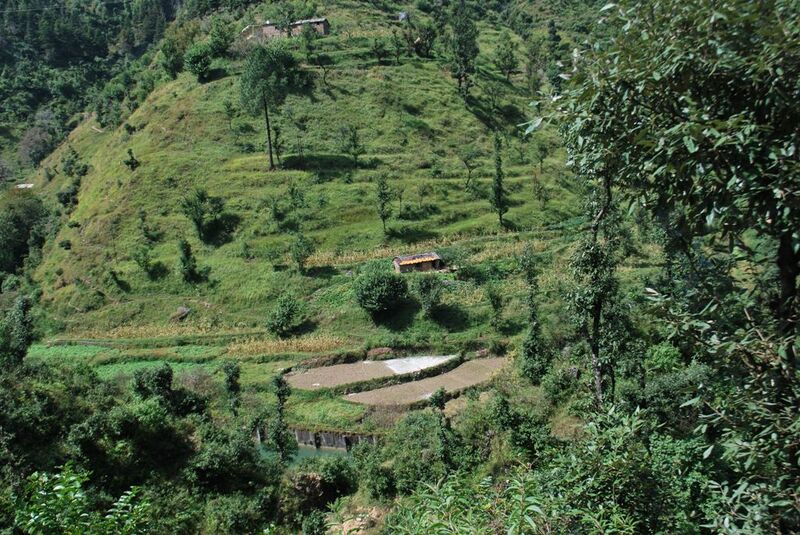 The Himalayas are all about experiencing the Joy of Nature. When man adapts and moulds himself to nature the Joy is enhanced manifold. 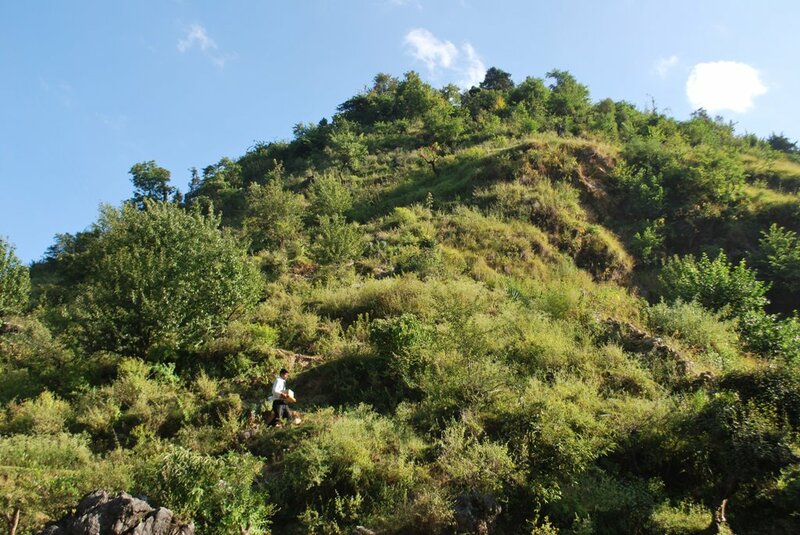 A perfectly organized trail by the nature loving staff of the JW MARRIOTT Walnut Grove Spa Resort ,Mussoorie to a CORN VILLAGE located in the Himalayas was just that, a memorable experience. The trip beautifully integrated an experience of the local Gharwali way of life with the thrill of a joyful ride on a motorcycle . 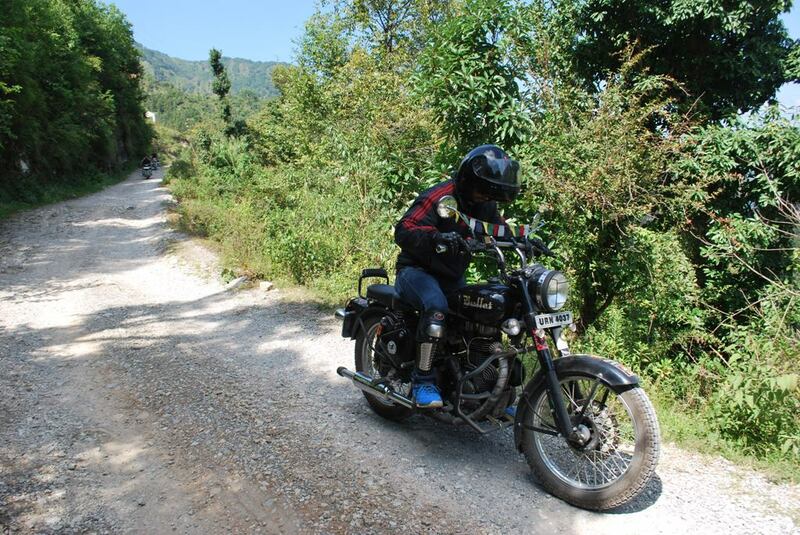 The extremely skilled driver on a Royal Enfield bike enabled me to have an uninterrupted and breathtaking 360 degree view of the enchanting landscape. It was indeed wonderful to go on a motorcycle as the fresh and cool mountain air rustles up your hair and massages the face as well. Corn ( or Maize) is the third most important crop after rice and wheat in the hills and forms the staple diet of the village folk as well. 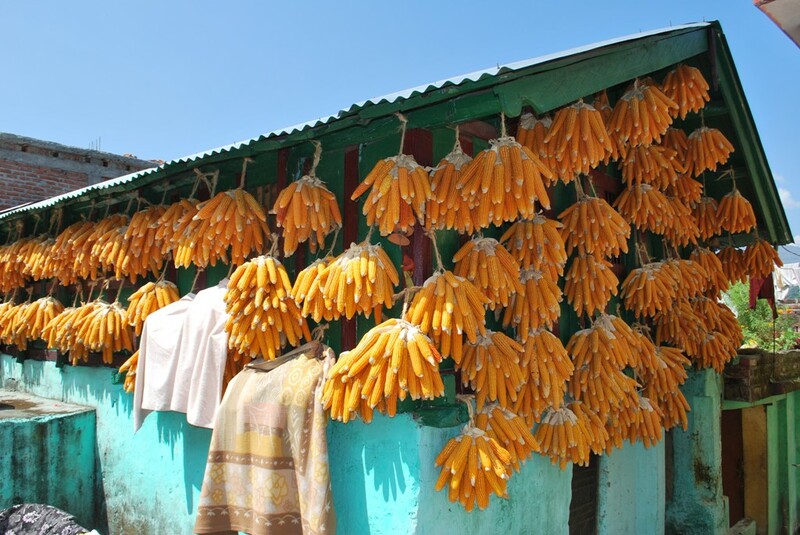 The Gharwalis ( as the locals are called) over the ages have perfected the art of drying the corn within their homes. 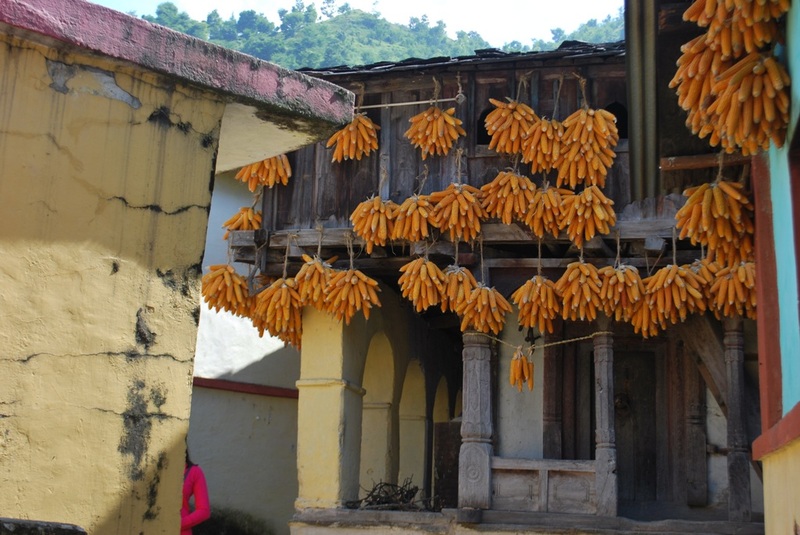 September to October is the time for harvesting Corn ( Scientific name: Zea mays) in the Hills of Mussoorie, Uttrakhand and thus the perfect time to visit Bhatoli the CORN Village. An enchanting view of the stepped farms of the Hills.Can you spot the Corn on the roof? Homes in the hills have been traditionally made of Wood. The sturdy though now endangered Himalayan White Oak ( Quercus leucotrichophora) covers most of these Hills and has been a source of timber for generations. This traditional carved wooden door welcomes us to the quaint village of CORN. The first stunning view of corn bunched up and hung upside down leaves me gazing in awe.It stunned my camera too which simply stopped working thereafter. The heritage wooden home in the centre is now gradually being replaced by brick and concrete homes. As I walk through this Organic and incredibly clean village I realize why it is called the CORN VILLAGE. 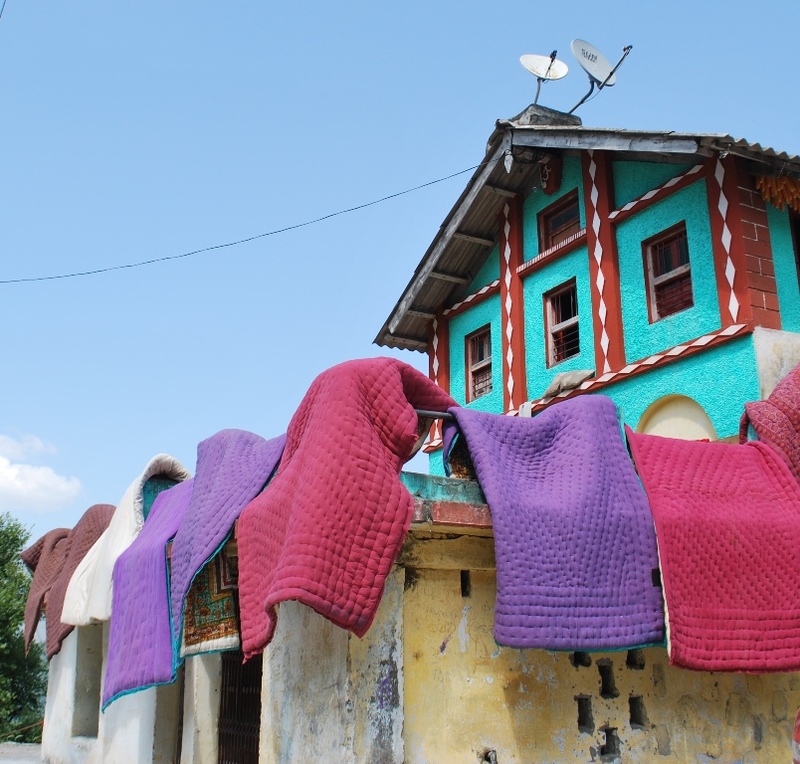 Colourful sunbathing Quilts give the Corn company in this house adorned by two dish antennas. While wooden homes have been replaced by brick and mortar ( pucca homes as they are called in Hindi) , some traditions like drying the corn, thankfully remain. Do notice the spotless alleys. 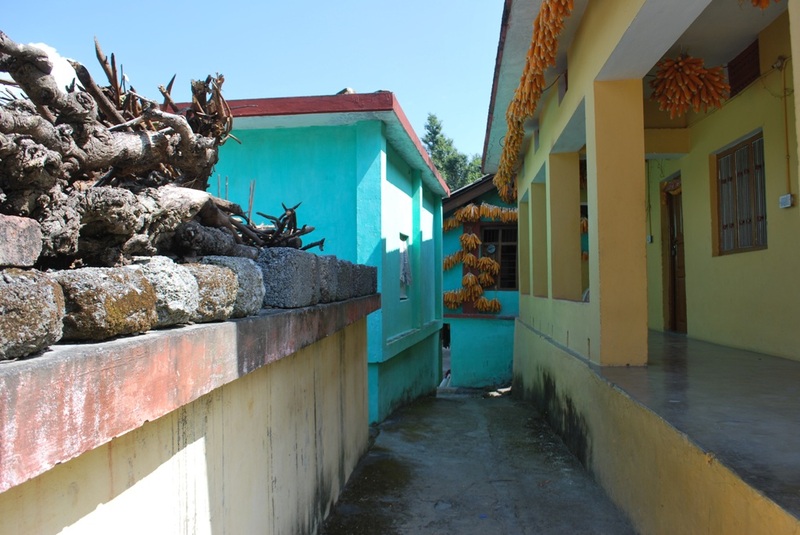 Another breathtaking view of a house with corn hung from the roof and the hills in the background. 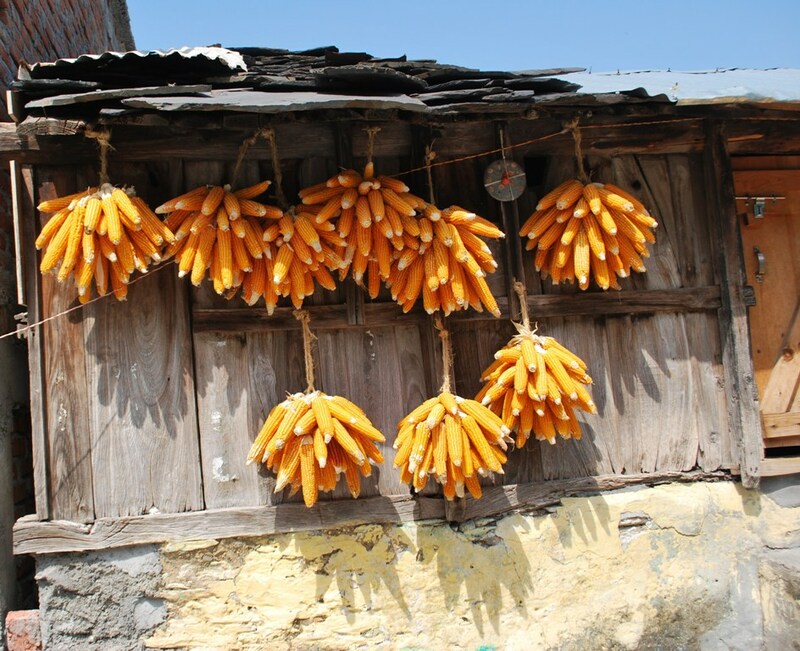 A far distance from its Mexican Origins , Corn has overrun this house in the scenic village of Bhatoli. Signing off as I sit down for a typical Gharwali lunch and Chapatis ( Indian Bread) made of Corn flour. 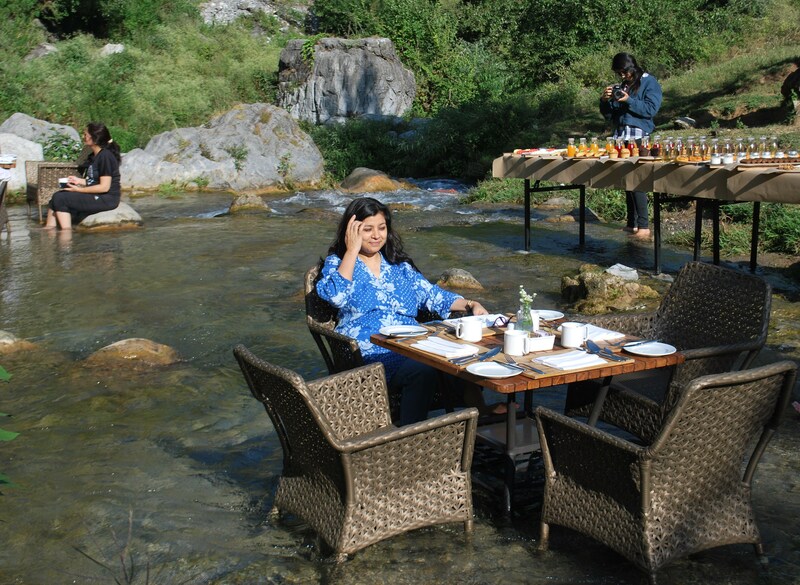 A marvelous trail planned to perfection by Prateek and Vaidehi of JW Marriott Walnut Grove Resort & Spa, Mussoorie. The bike ride was a steal. 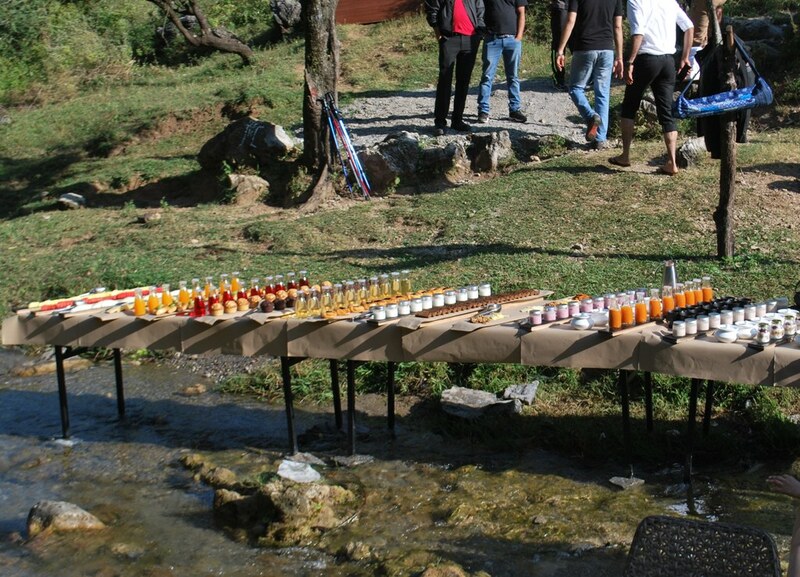 A wonderful outreach by the luxurious Hotel to the friendly and hospitable villagers who spread out a welcome feast. Hope you have read the earlier posts ( THE SECRET TRAP and THE MUSHROOM TRAIL) , all part of the WALNUT TRAIL. Be not impatient friends, the Walnuts will follow as well. Keep following. 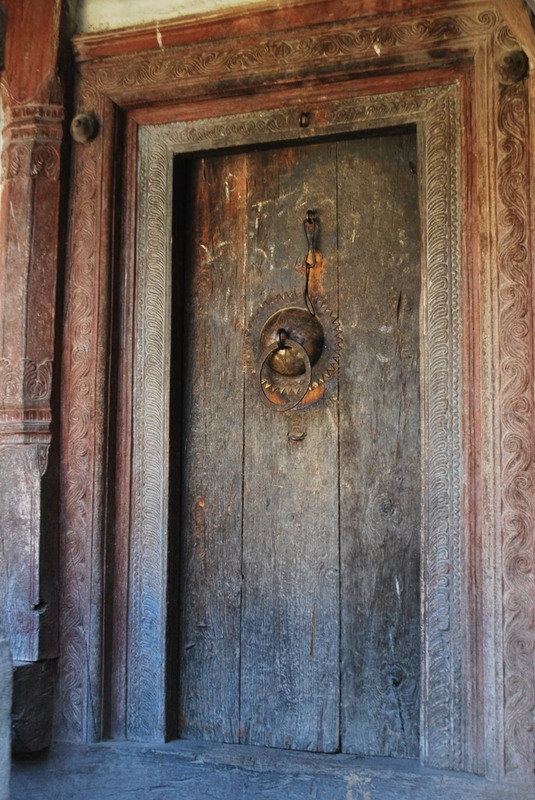 Dwarka ( dwar in hindi ) literally translated means the DOORWAY . DWARKA is an ancient city steeped in mythology and is located at the western edge of India and overlooks the vast ARABIAN SEA. It is supposed to have been built thousands of years ago and was once a thriving port city.It was the Door to the Seas. A lighthouse reminds us of trading ships laden with silk and spices once docking here from faraway lands of the Pharaohs in Egypt. 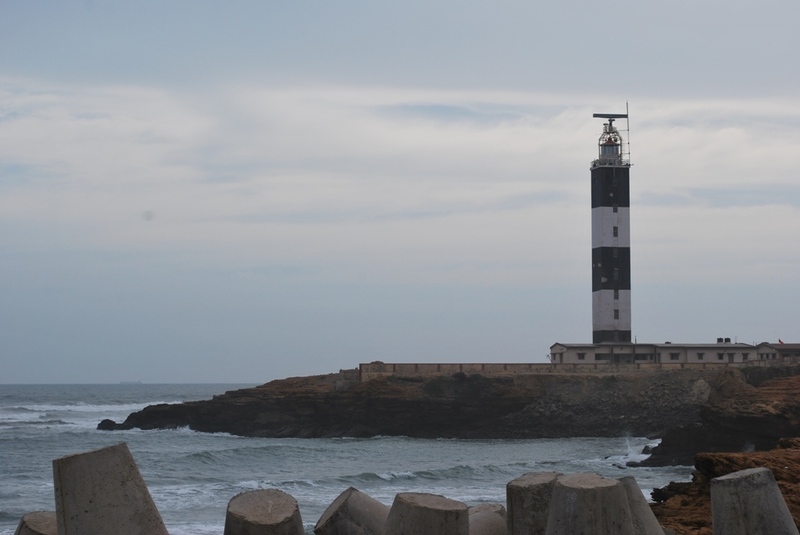 The lighthouse represents the western edge of INDIA. 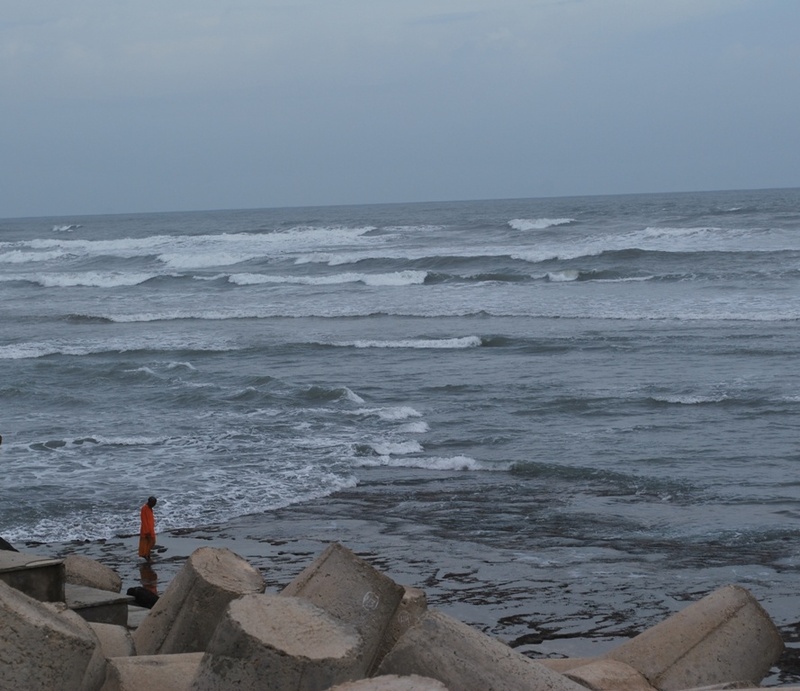 Dwarka finds a unique place in Hindu scriptures. It was the magnificent and prosperous capital of Lord Krishna thousands of year go. Going back to 2500 BC , Dwarka is repeatedly mentioned in historical references as well as in Hindu scriptures. Recent Explorations and surveys of the sea bed near modern Dwarka have revealed the existence of a city (much like Atlantis) retaken by the sea. 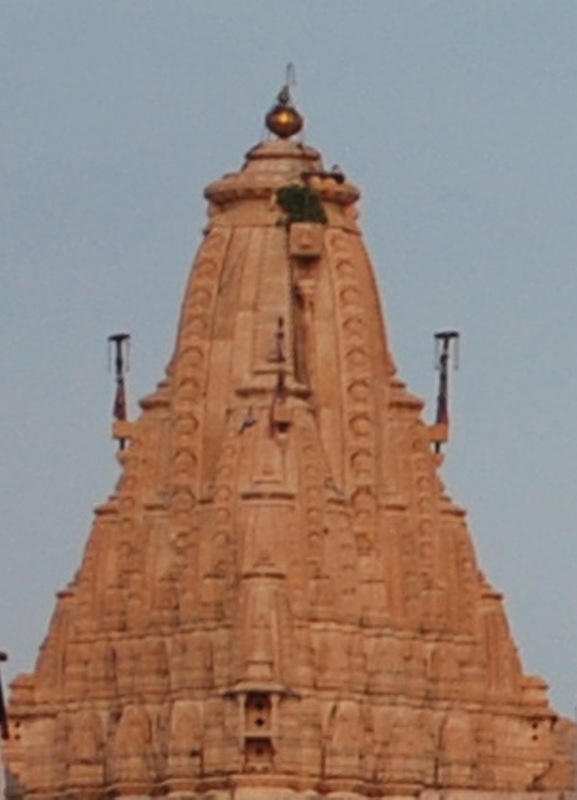 The temple at Dwarka is an important site of pilgrimage for Hindus and is one the four CHARDHAMS , each located at the four corners of the county. This temple is called Samudra Mandir or the THE SEA TEMPLE. Gazing out towards the endless waters of the ARABIAN SEA is a unique and humbling experience. 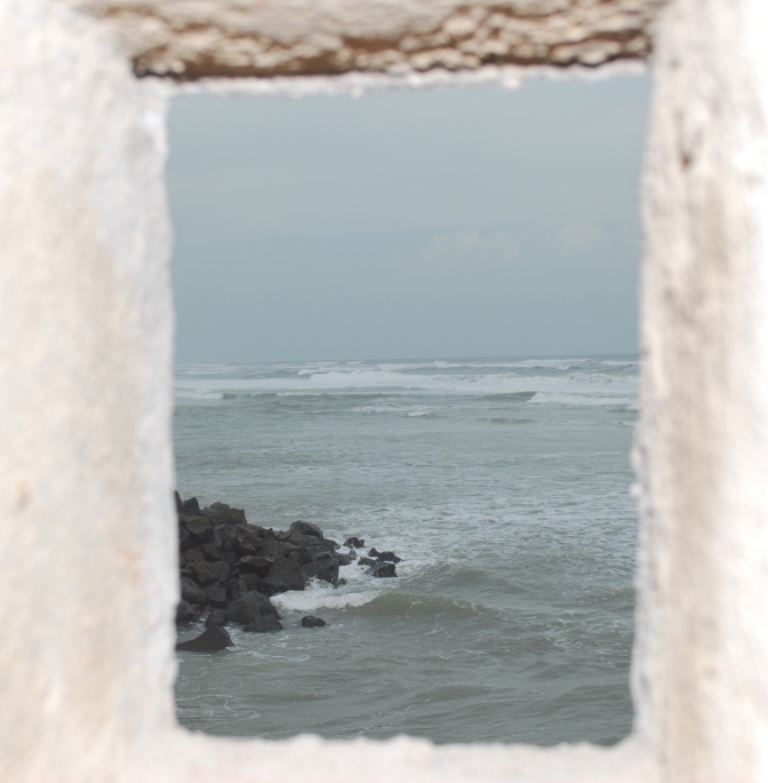 I peered through a small window inside the temple and watched the waters swirl and crash against the rocks below as the River Gomti submerges itself into the Sea. 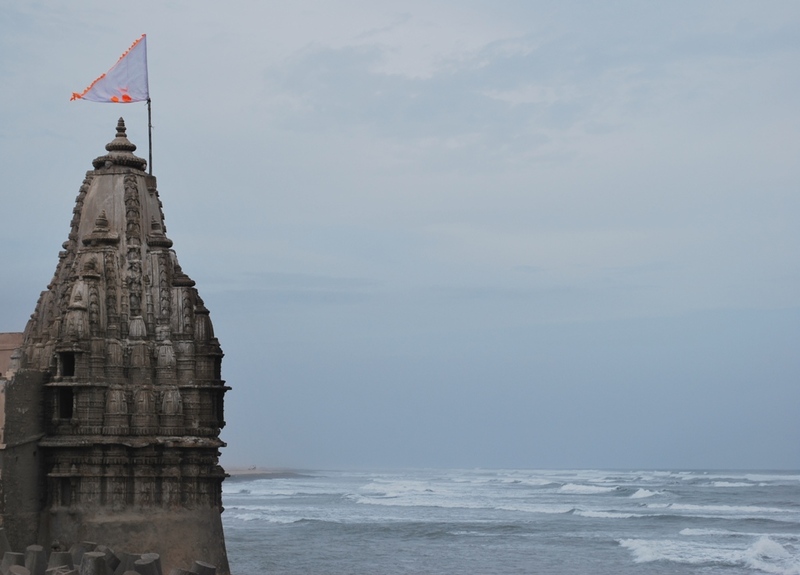 This temple is located at the confluence of the River Gomti and the Arabian Sea in Dwarka. I sign off with this heavenly view. Jagdish Temple is the EPICENTRE of historical Udaipur. 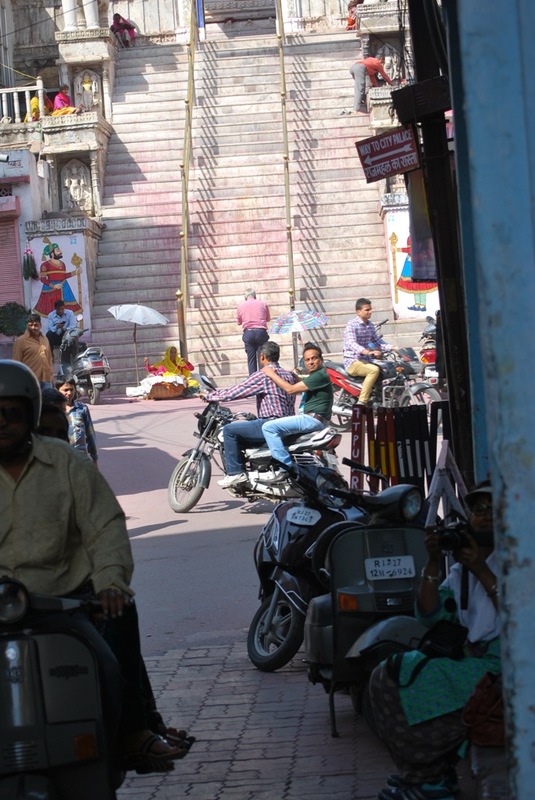 You can be witness to the life of the common citizen of Udaipur from here. For the Royal experience you need to walk for 2 minutes from the temple to the CITY PALACE. The walk is lined with shops , some of which house vast, I repeat vast and gorgeous treasures of ART. The pictures that follow are a peep into the activity of commoners. Take time to ponder over this photograph. There is some activity in every corner of this picture. 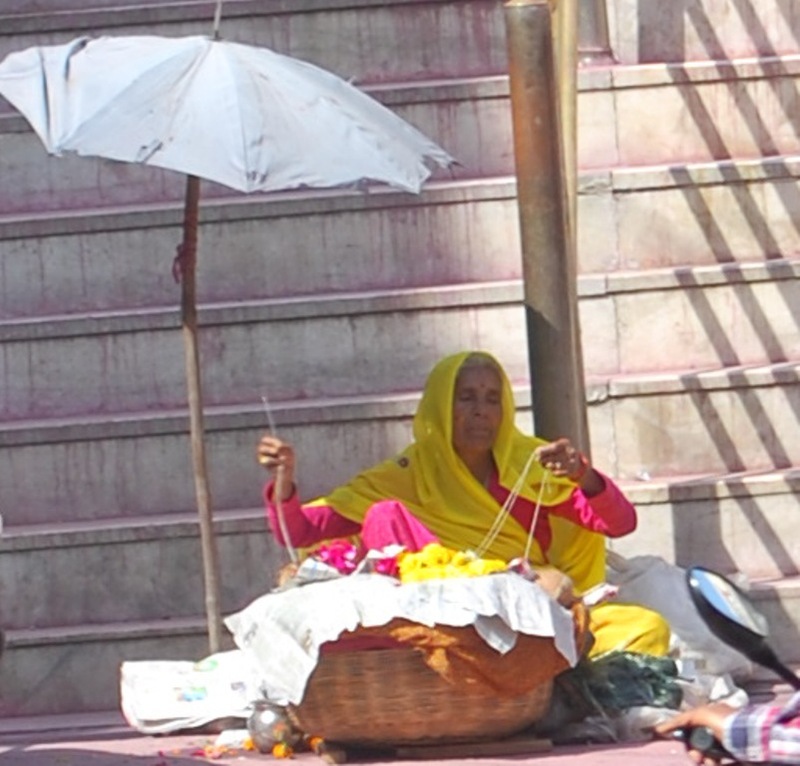 At the level of the street or the footsteps of the stairs leading to the temple is this elderly lady sewing a garland of flowers. Do notice the metallic Lota ( an ancient Indian vessel used for storing water) placed on the right of the basket.Have written on the LOTA , please check it out, very intriguing. Colourful painted guards, peacock feathers and Mobile phones form the second level up the flight of stairs. 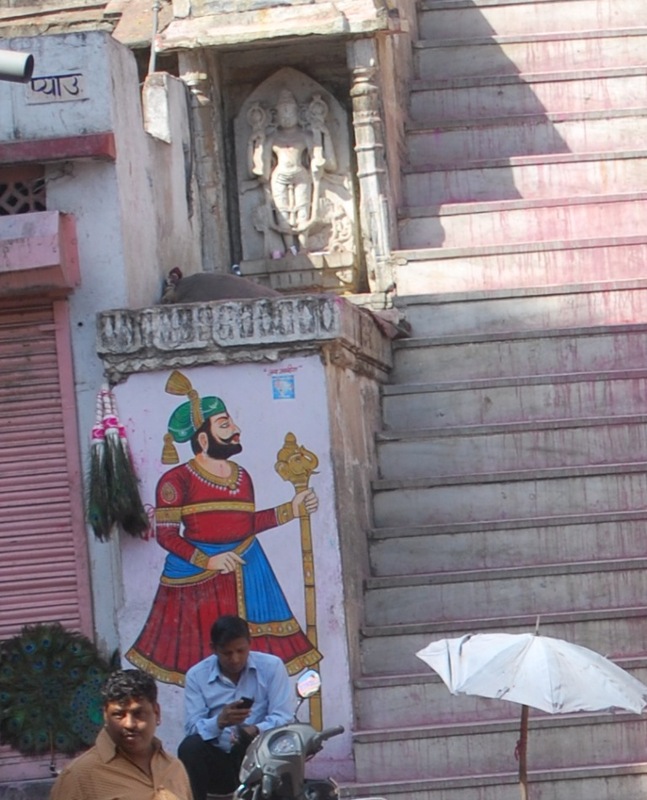 The usually white marble steps are coloured pink due to the festival of Holi being played here this morning. Watch out for the feast for the eyes, THE ROYAL HOLI in the blogs to follow. 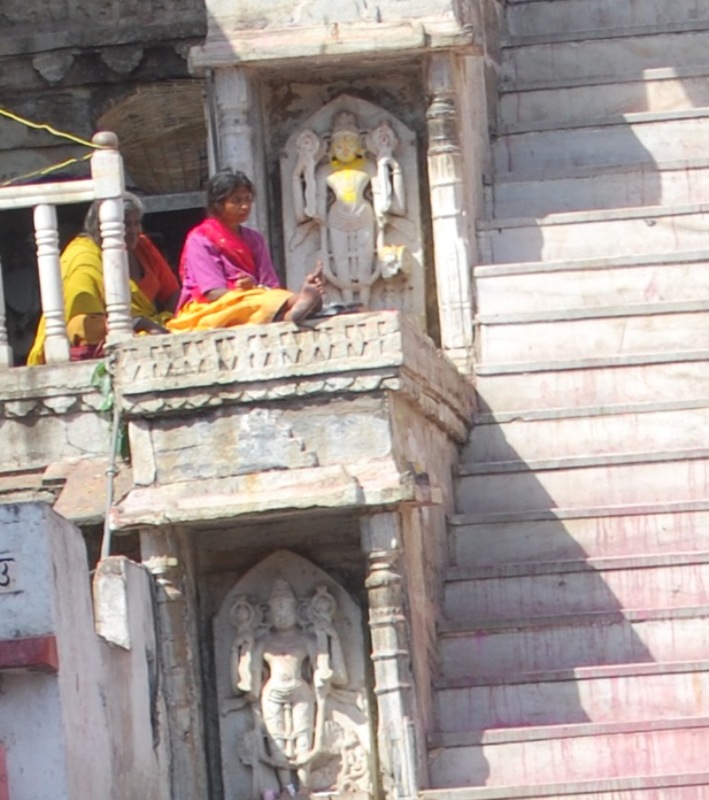 The mother and daughter duo soak in the sun after being drenched in the waters of HOLI. The spire of the 450 year old Jagdish Temple rises over the sanctum sanctorum. 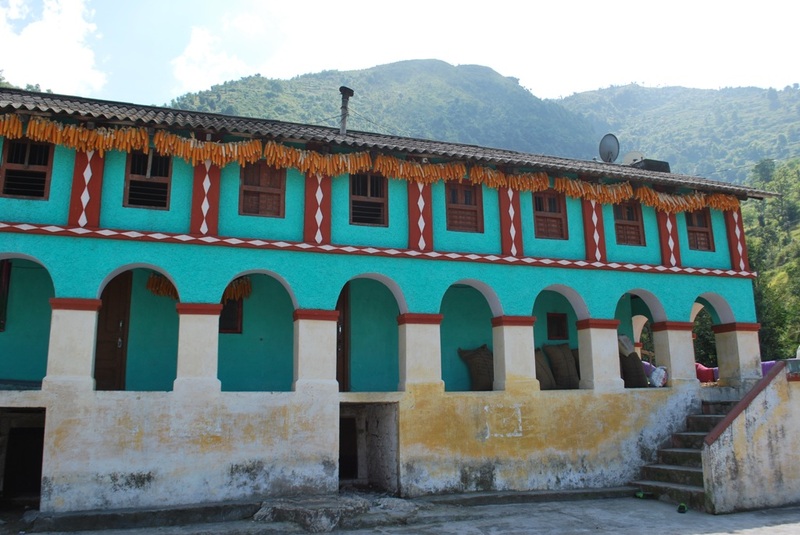 If you are fortunate you could hear Rustic Folk music as villagers sing and dance spontaneously in front of the main deity. Jagdish is one of several names for LORD VISHNU. There are many historical incidents, myths and fables about this temple.Stories of politics and intrigue are whispered in hushed tones. The view of the epicenter, THE JAGDISH TEMPLE and the Havelis ( now lovely hotels) of Udaipur viewed from the lake. Personally have experienced many emotional moments in the temple. As you walk around the lanes you may lose your bearings. In Udaipur be ready to be transported back in time. It really is a town out of a fairy tale. With fabulous Palaces and temples in the midst of a lake , forts and Maharajas it has it all. If you really wish to soak in the local flavours, stroll along the ghats of the lakes and the bye lanes around Jagdish Mandir. Have a Masal chai in a Glass ( not a mug or tea-cup) , sit at a local cafe and watch the world go by. Patience is the key, drown yourself in happiness and do not rush through time. 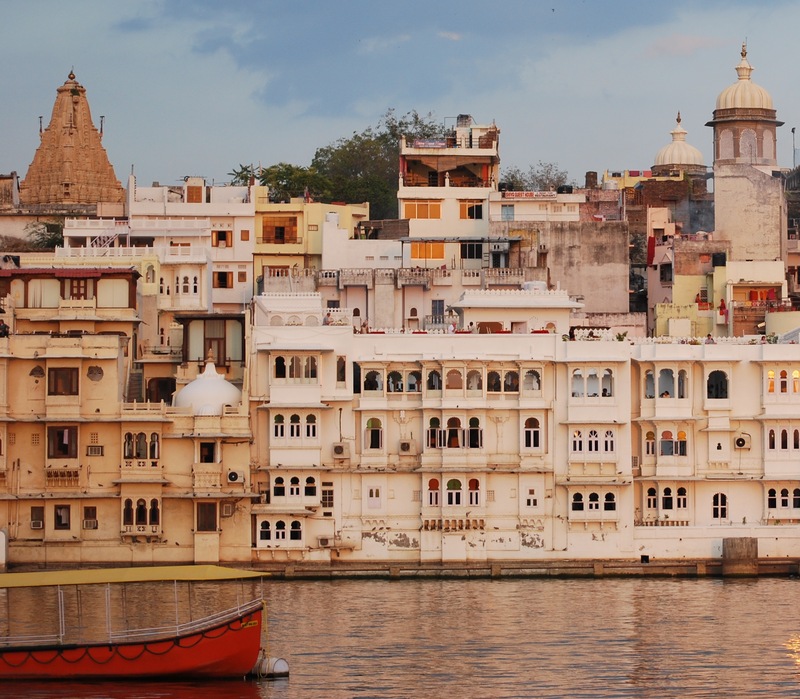 Go with the leisurely Flow of Life in charming Udaipur. The dog ( only rear visible) is fast asleep on this old bench made of stone. 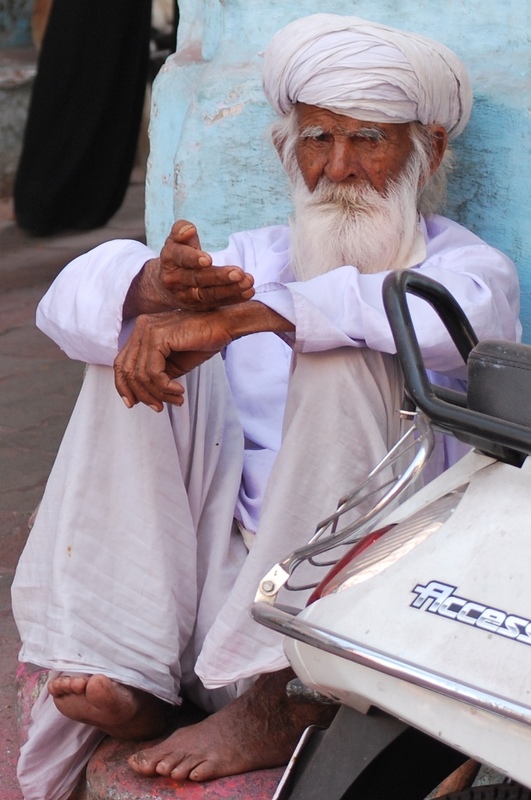 This elderly gentleman in white had made himself comfortable on the roadside benches as well. This beautiful doe eyed lady sits cross legged, enjoys her Masala Chai and acknowledges the photographer with a Queen like wave of her hand. Watch and observe every detail as you stroll along , it is a city with a tremendous character. Simply do as the Cow does, wait patiently for the highly recommended shop to roll up the shutters. An awful cold never comes alone, it travels with many companions such as headaches and mild fever to name a few. The common cold can cast its Spell of Doom at anytime. However it is ably assisted during the monsoons by high levels of humidity. A cold and a cough can ruin your travel experience.It is best to dismiss it forthwith.I share with you a Wizard’s brew you could prepare yourself as well, which does exactly that. I reveal the secret of an ENCHANTING GOBLET and a miraculous and curative drink. 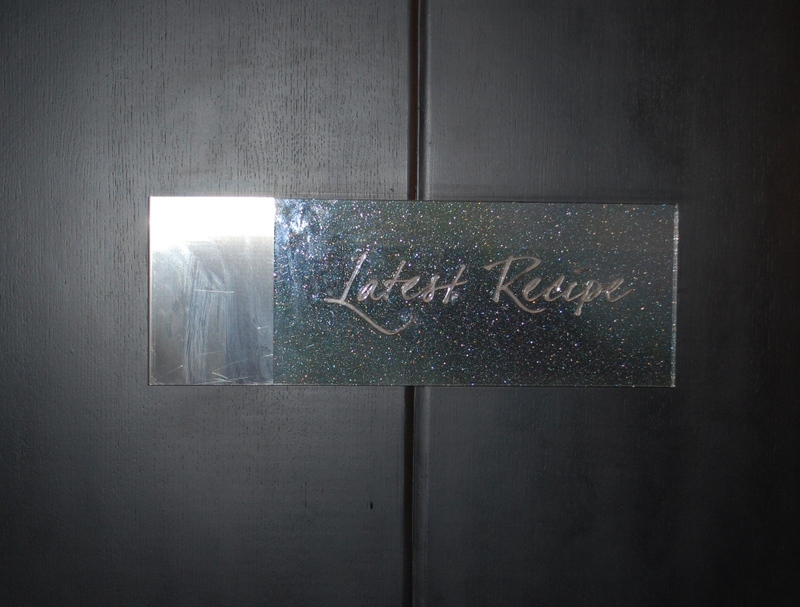 It was specially concocted and served in a restaurant called Latest Recipe ( Le Meridien Spa & Resort, Mahabaleshwar) . The staff probably heard me coughing and caught me sniffling whilst dabbing my handkerchief to the ends of my sore nose. Miraculously a very large Goblet with wisps of smoke emanating from a light yellow brew was placed in front of me. It was called THE TODDY DRINK by the wizard Abhishek. I gleefully peered into the magical goblet , breathing in the aromatic steam and saw the most amazing combination of spices floating at the top. 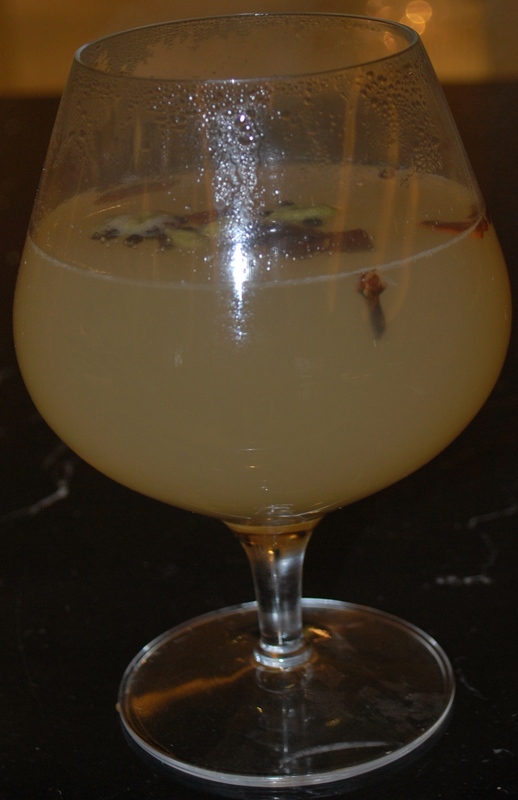 The cocktail worked wonders and revealed the medicinal qualities of these ancient spices ( angels for me) used in AYURVEDA. I am giving the Sanskrit names to reveal the importance these spices had even 2500 years ago. The first angel is the clove and can be seen clearly in the picture below. Dev Kusum literally translated means Flower of the Gods. How appropriate as it is considered the Champion of antioxidants. Having anti microbial, anti fungal, anti viral properties it is an excellent antidote to a common cold. In China and Iran ( ancient Persia) it is considered an aphrodisiac. 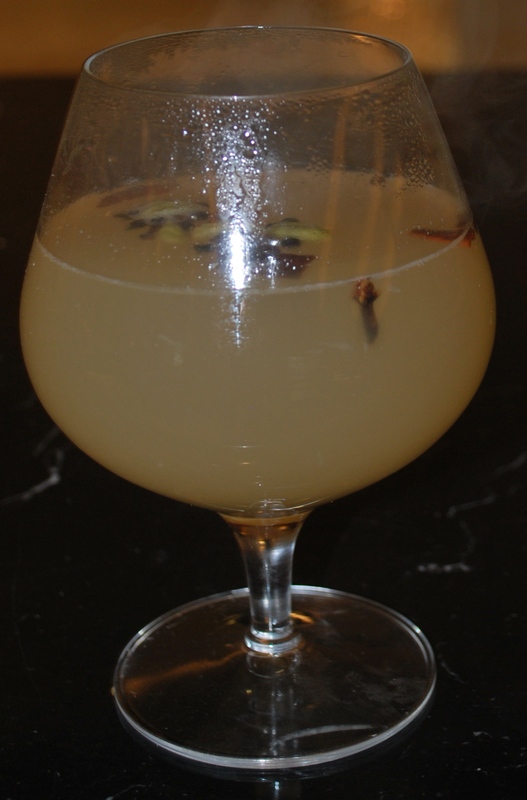 The Toddy cocktail was however served in India and am sure the caring staff at the Le Meridian was unaware of any such mythical properties. ( those reading could improvise if they so wish) . The delicious warm brew has lemon and ginger juice which forms a formidable weapon against the common cold. 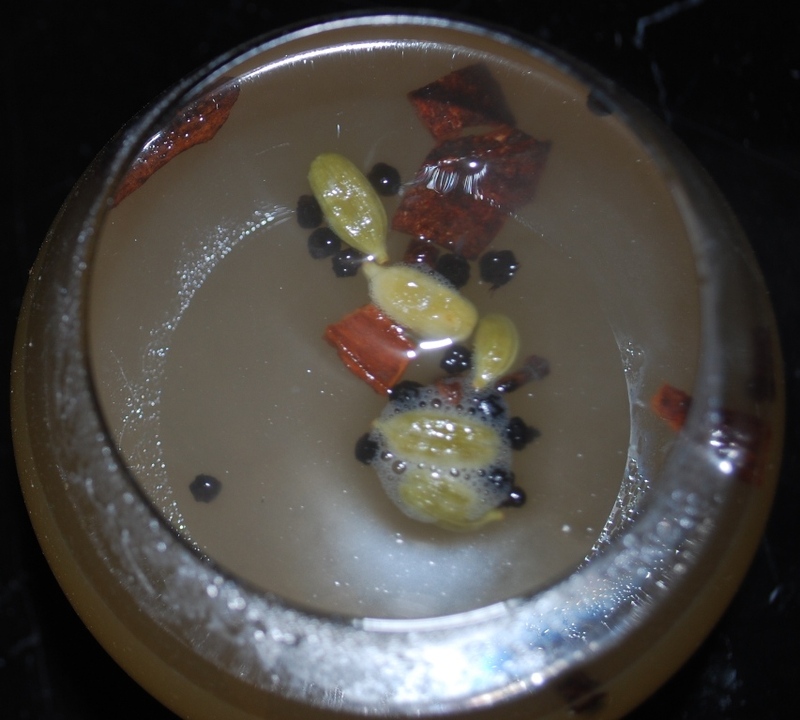 The second spice which came to my rescue were the little green pods you can spot in the centre of the goblet. Ayurveda’s most powerful mucus destroyer.It sure stopped my leaking tap. The third angel was what led to the discovery of the Americas and was once labelled as BLACK GOLD. Kali mirch( Hindi), Black Pepper ( English) , Piper nigrum ( Scientific) , Marich ( Sanskrit). The black pepper is very rich in the vitamins B-complex.It helps in opening all obstructions in the channels of the body. The little black dots floating are Black Pepper. 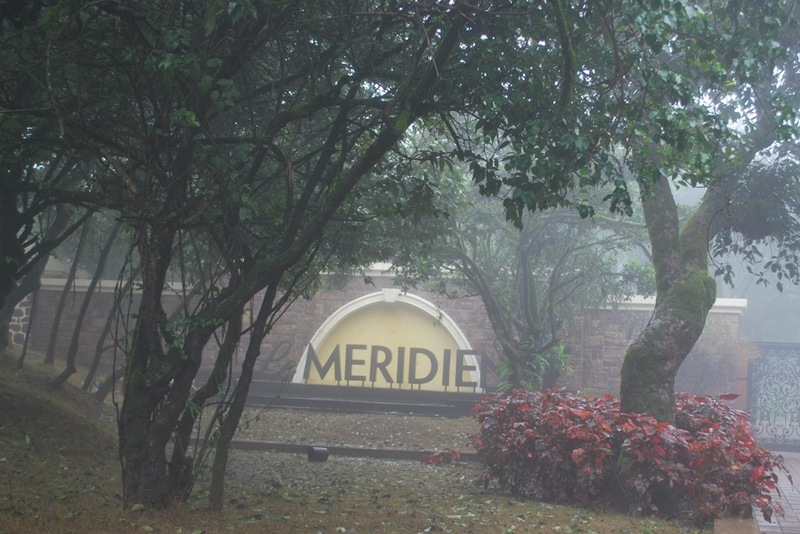 The Le Meridien Spa & Resort at Mahabaleshwar is a treasure trove for nature lovers and is I believe a mine for medicinal plants and herbs. The fourth angel is the bark of a tree and is easily distinguishable from the green cardamom and the black pepper dots in the picture above. 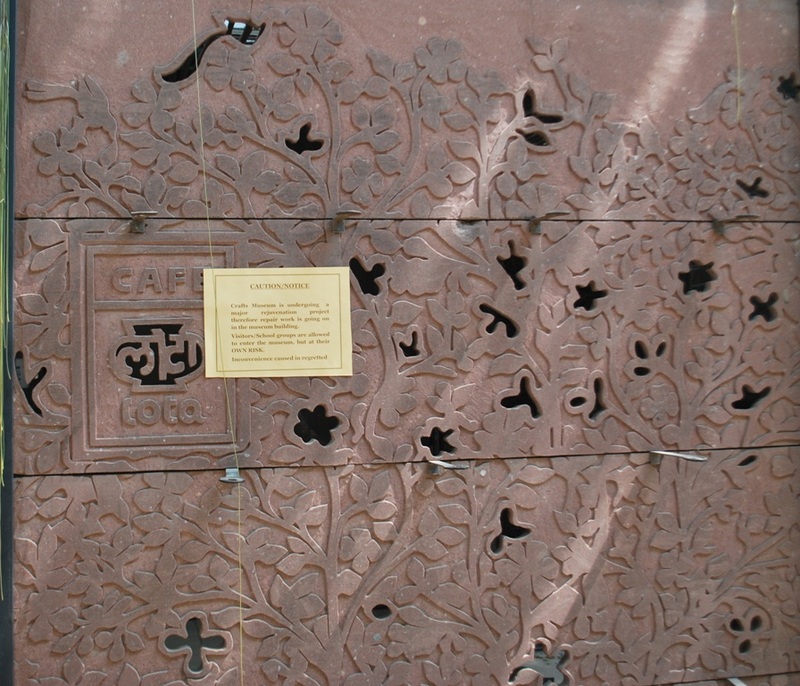 Dalchini ( Hindi) ,Cinnamon( English) ,Cinnamomum Zylenicum ( Scientific) Twak ( Sanskrit). Qualities ( Gunn) : Taste ( raas) : Potency (virya). This dealt the final blow to the common cold as the bark of the Cinnamon has many Gunns (qualities) as a Powerful Germicide, Insecticide and Fungicide, all rolled into one. Thank you Abhishek , you were the wizard who vanquished the spoiler ;the common cold . I rediscovered a multipurpose utensil here that I have been familiar with from my childhood. I have however never even given it a thought. The Lota ( pronounced LO as in low and TA as in task) is a beautiful utensil designed in India thousands of years ago. The Spherical base provides it stability , whereas the slender neck enables the human hand to firmly grip it. 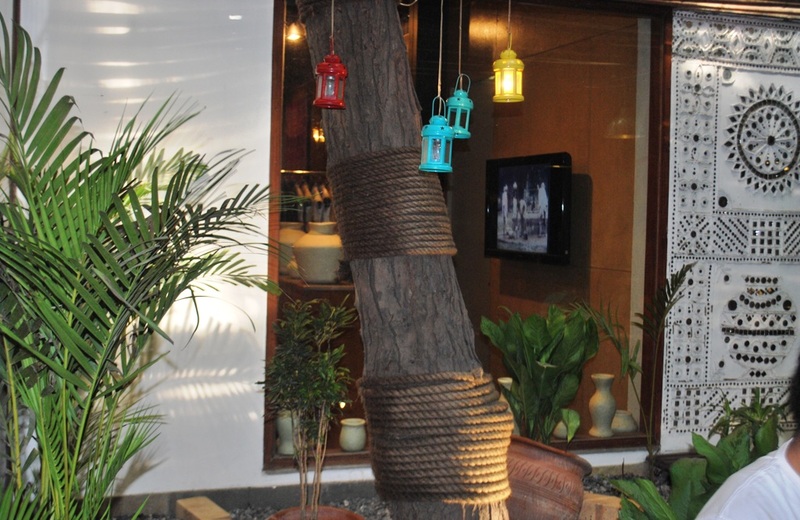 It now lends its name to an aesthetically designed restaurant and boutique located within the Crafts Museum Complex. Historians claim the Ancient Indians were inspired from the fruit THE MELON, while designing the LOTA. 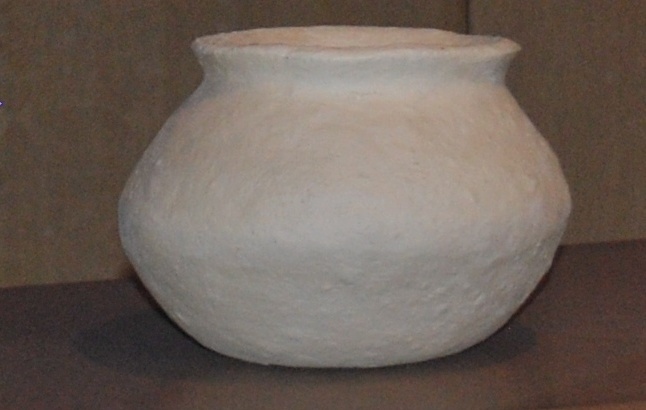 This unique, practical and beautiful vessel is used for storing water, milk and even ghee.It is an integral part of every home in India. Water stored in a copper Lota is recommended in Ayurveda for imparting immunity to the body. Used in Yoga with a spout and for religious ceremonies by both Hindus and Muslims , the Lota can be found in an Indian home at the Altar ,the Kitchen and the Bathroom. Primarily used for transferring liquids it can be made of clay, ceramic, metal or even wood. 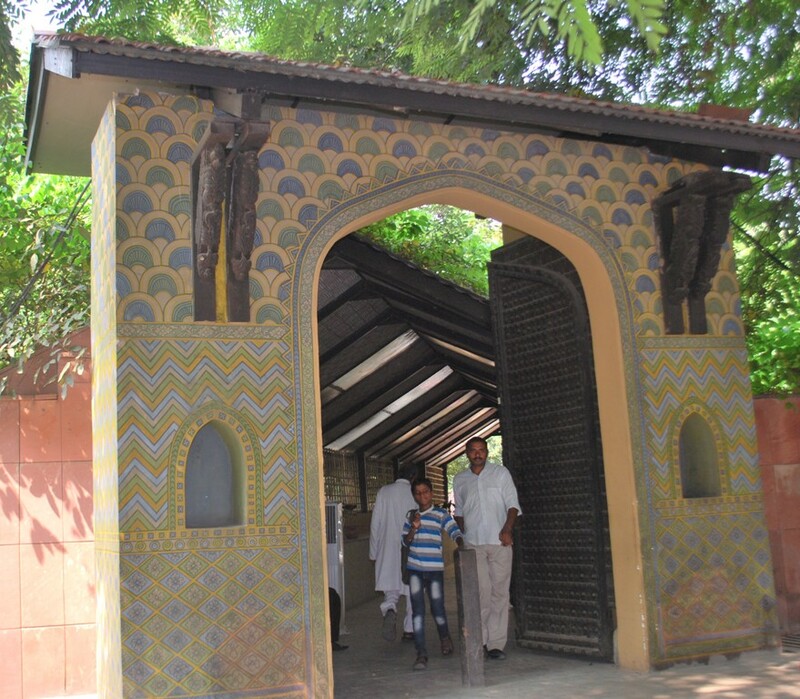 The lovely screen at the entrance has the name “CAFE LOTA” carved in stone. Currently an ugly notice scars the aesthetics of this beautiful screen. 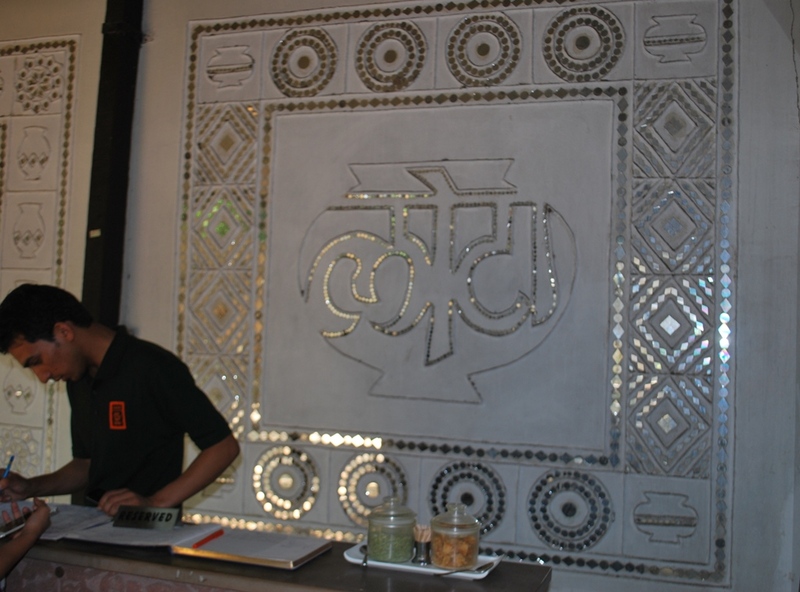 Lota written in Devnagri Script ( Hindi) forms the backdrop of the reception. Do see the glass Jars containing Anis ( saunf in Hindi) and Jaggery ( Gur in Hind) in the foreground. Try them after a meal in India. The restaurant is built around the trees . 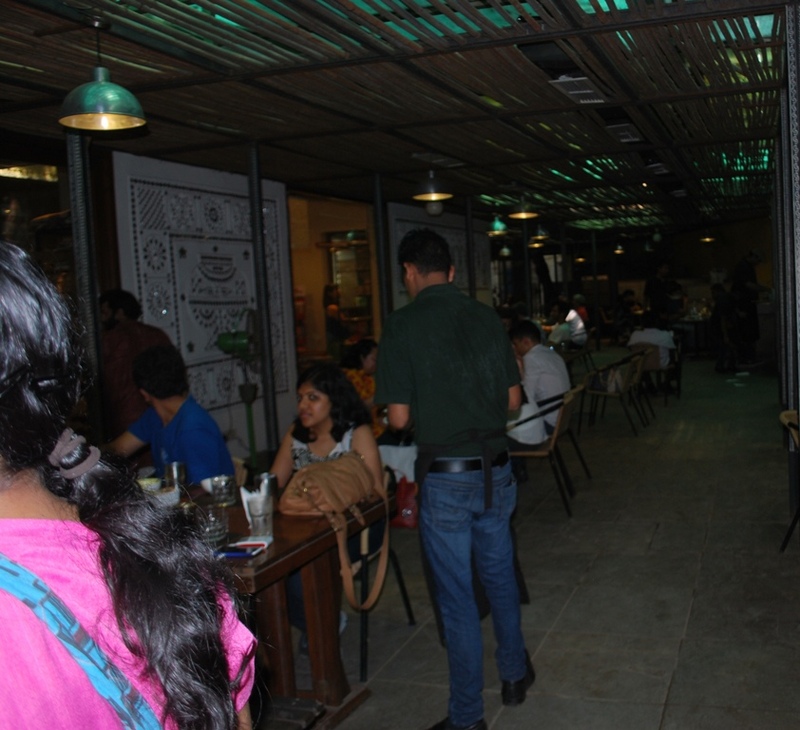 Abutting the large and Interesting boutique by the name LOTA , the restaurant was full on Sunday Afternoon. We had a quick glance at the Interesting Menu but were unable to savour the dishes. Maybe another day, another time. There are numerous phrases in Indian Languages inspired by this simple but elegant LOTA. I was thrilled as I had canned another blog in my head.